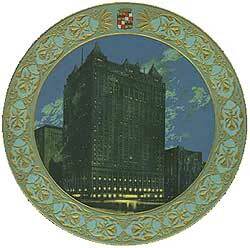 In January 1925, just a month after the Book-Cadillac opened, the Chicago based industry magazine Hotel Bulletin published a special 104 page issue fully devoted to the new hotel. Here we find a detailed account of the hotel's design and construction. The backgrounds of employees and companys providing materials was also included. Rounding out this amazing historic record are hundreds of photos of rooms, people, china, machinery, and other articles. Interestingly enough the forward to this edition reads: "Readers will find much valuable information in this supplement and we suggest its careful preservation for future reference as the edition is limited." With that in mind I have provided many of sections of this issue describing the public rooms for your enjoyment. The tour is arranged by floor. You will find floor plans. By clicking on a room on the floor plan a description and photo of that room will be brought up.